Lenders will be extra diligent when underwriting home loans in 2014, as new mortgage regulations go into effect in January. The rules put pressure on lenders to verify that borrowers have the ability to repay their loans. Keep good records of your finances, including bank statements, tax returns, W-2s, investment accounts and any other assets you own. Be ready to explain any unusual deposits to your accounts. Yes, the $500 that Grandma deposited in your account for Christmas could delay your loan closing if you can't prove where the money came from. Lock a rate as soon as you can. Rates will likely climb in 2014 as the Federal Reserve is expected to reduce the pace of the economic stimulus program that has long helped keep rates low. If you are planning to get a mortgage, lock in a rate as soon as you are comfortable with the numbers. Refinance now -- if you still can. Many homeowners lost the opportunity to refinance at a lower rate when rates jumped in 2013. But those who are still paying more than 5 percent interest on their home loans might still have an opportunity. If you think you may be able to save with a refinance, but you are not sure, it doesn't hurt to try. Speak to a loan officer and take a look at the numbers to see if refinancing still makes financial sense for you after you consider how long it will take to break even with the closing costs. Buyers, use your bargaining power. 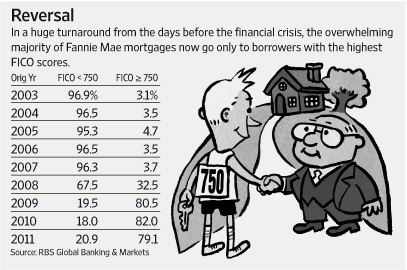 As mortgage rates climbed, lenders lost a big chunk of their refinance business. In 2014, they will turn their attention to homebuyers and will fiercely compete for their business. Buyers should take advantage of bargaining power they gain with that increased competition. Shop around for the best deal and look beyond the interest rate on the loan. Learn your rights as a borrower. Mortgage borrowers will get many new rights as consumers this year when new mortgage rules created by the Consumer Financial Protection Bureau go into effect in 2014. If you run into issues with your mortgage servicer in 2014 or fall behind on your payments, make sure you are aware of your rights and put them to use. It's nearly impossible to get a mortgage without decent credit these days. That will continue to be the case in 2014. If you are planning to get a mortgage, monitor your credit history and score until your loan closes. The best mortgage rates usually go to borrowers with credit scores of 720 or higher. You may still get a mortgage with a score of 680, but lower scores will mean higher rates or higher closing costs. Lenders don't want to give out loans to borrowers who will have little money left each month after they pay their mortgages and other debt obligations such as credit cards and student loans. If that becomes the case, the lender will tell you that your DTI, or debt-to-income ratio, is too high and you don't qualify for a loan. Try to keep your monthly debt obligations, including your mortgage and property taxes, below 43 percent of your income. Consider alternative mortgage options such as ARMs. Mortgage rates are rising, but there are alternatives to grab a lower rate, depending on your plans. A homeowner planning to keep a house for seven to 10 years could take advantage of lower mortgage rates by choosing a seven- or 10-year ARM instead of the 30-year traditional fixed-rate mortgage. Rates on adjustable-rate mortgages can be as much as one percentage point lower than on fixed-rate loans. If you are not sure for how long you plan to keep the house, a fixed-rate loan is probably the better choice. Considering an FHA loan? Reconsider. FHA loans have long been popular among first-time homebuyers because they require low down payments and have somewhat less strict underwriting standards than conventional loans. But they come at a price. Mortgage insurance premiums on FHA loans are likely to continue to rise in 2014, and after recent changes, the borrower is now required to pay for mortgage insurance for the life of the loan. Try to qualify for a conventional loan before you apply for an FHA mortgage. Yes, mortgage rates will likely climb in 2014. But don't panic, thinking you have to buy a home now to grab a low rate. If you are shopping for a home, do your best to move quickly, but remember that this is one of the biggest financial decisions of your life. Get your mortgage and buy your home when you feel ready. If you want to learn more or need help, please do not hesitate to contact us and speak with one of our friendly mortgage specialists at Bridgeview Mortgage Corp.
Taxes are higher, gas prices are rising, and Washington is in budget gridlock again, but the nation's housing market is viewing the world through rose-colored glasses. Two pieces of data released Tuesday show that the recovery in real estate continues to be a bright spot in the still somewhat sluggish economic rebound. New-home sales leaped in January versus the previous month to the highest level in 4-1/2 years, government data showed, as steady job creation and record-low interest rates spurred buying. In the meantime, single-family home prices picked up in December, closing out 2012 with the biggest yearly gain in more than six years, a closely watched survey showed on Tuesday. For the final quarter of the year, prices gained 2 percent on a seasonally adjusted basis. A "For Sale" sign is posted in front of a house on November 27, 2012 in Los Angeles, California. The number of previously occupied homes for sale is at a 13-year low. That shortage creates more demand for new homes. Builders began construction on the most homes in four years last year. The increase in home building has helped boost construction hiring. The industry has gained 98,000 jobs since September, the best stretch since the spring of 2006. Still, the increases in new-home sales are coming from depressed levels. Sales plummeted to a record low in 2011. And sales are still well below the 700,000 annual level that economists consider healthy. As mortgage rates sink deeper into record territory, homeowners are refinancing into 15-year loans at a pace not seen in a decade, aiming to pay off their debt in time for retirement. Freddie Mac's latest mortgage rate survey showed the traditional 30-year fixed-rate loan averaged 3.75% this week, down from 3.78% last week. It was the fifth straight week of record lows. Even more eye-catching in Thursday's survey was the average for a 15-year fixed loan — 2.97%, down from 3.04% a week ago. It was the first sub-3% reading in the nearly 21 years that Freddie has tracked the 15-year loan. With housing markets still troubled, the rates are mainly benefiting refinancers whose luck or self-discipline has left them with significant home equity. Purchase lending remains sluggish: The Mortgage Bankers Assn. says that fewer than a quarter of mortgages these days are used to buy homes. But the latest surge in refinancings caused the trade group last week to boost its projection for mortgage volume this year by nearly $200 billion, to $1.28 trillion. People refinancing mortgages often debate the merits of 15-year or 20-year loans that may hasten their payoff date but require bigger payments than a 30-year mortgage. At the rates quoted this week by Freddie Mac, the monthly principal and interest payment on a 30-year fixed loan of $315,000 would be $1458.81, compared to $2,170.79 for a 15-year loan. During the housing boom, few refinancers even considered shorter-term mortgages, which made up just 10% of all refis in 2006. To the regret of many, they instead extracted as much bubble-era equity as they could by taking on larger mortgages with long repayment times, and often with risky characteristics. "People were getting 30-year interest-only loans, and they were pulling out all the cash they could," said Richard T. Cirelli, president of RTC Mortgage Corp., a Laguna Beach loan brokerage. "Now it's just the opposite — they want shorter-term loans, and they're strategizing to get the mortgage payoff to coincide with their retirement," Cirelli said. "We're seeing 20-year loans, 15-year loans and even quite a few 10-year loans." Instead of cash-out loans, some borrowers are even putting cash in when they refinance, he said — for example, to get their balances down to $417,000 for a one-unit property, the maximum amount at which the lowest interest rates are available. Also contributing to the trend: recent changes in the Obama administration's Home Affordable Refinance Program, which cut the fees for certain borrowers getting new loans if they reduce the term of the mortgage to less than 30 years. By Freddie Mac's count, 31% of the refinancers in the first quarter of this year opted for shorter-term loans. That is the largest percentage since 2002, when the typical rate for a 15-year home loan ratcheted down over the course of the year from about 6.5% to less than 5.5%. About 35% of refinancing homeowners chose shorter-term loans that year, saving themselves about half a percentage point in interest compared with a 30-year loan, Freddie Mac economist Frank Nothaft said. The type of borrower in both cases was the same, according to Nothaft — people in their 40s and 50s whose incomes had risen enough that they could afford hundreds of dollars more each month to pay off more principal. "It costs them more, but they're looking to own their homes free and clear when they retire," Nothaft said. The Freddie Mac surveys assume that borrowers pay about 0.75% of the loan amount to the lender in upfront fees and discount points. Solid borrowers who shop around often find slightly better rates, and homeowners also can lower the rate by paying additional discount points. The survey does not include third-party costs such as appraisals and title insurance. Mortgage rates tend to rise and fall along with the yield, or effective interest rate, on U.S. government debt. The 10-year Treasury note serves as a benchmark for fixed-rate loans. Five years ago, in June 2007, the average yield on the 10-year Treasury was above 5%, and late last June it exceeded 3%. The yield fell to 1.58% on Thursday, as investors troubled by the threat of defaults in European countries crowded into the perceived safety of U.S. government bonds. "It would have been hard to find economists at the beginning of this year who thought we'd see this kind of decline in rates," Nothaft said. "I certainly did not." The Obama administration on Wednesday detailed its latest plan to help millions of homeowners refinance their mortgages to today's historically-low rates. The plan is estimated to cost between $5 billion and $10 billion. To pay for it, President Obama said he does not plan to add to the deficit. Instead, he wants to impose a fee on large banks -- a move that may have a hard time making it past members of Congress, who have rejected the notion of taxing the banks in the past. The refinancing plan is the latest in a string of programs designed to help solve the nation's housing market crisis. Three years ago, Obama unveiled the Home Affordable Modification Program (HAMP) foreclosure prevention effort and soon followed up with the Home Affordable Refinance Program (HARP), which helps homeowners who owe more on their homes than they are worth refinance their loans. But the programs, which sought to help 8 to 9 million homeowners who hold loans from government-supported Freddie Mac (FRE) and Fannie Mae have helped only some 2 million to date. What's different about this latest proposal is that it would help borrowers with private, non-government bank loans who could not obtain new refinanced loans in the past because they owed more on their mortgages than their homes were worth. "If you're underwater through no fault of your own and can't refinance, this plan changes that," Obama said in a speech in Falls Church, Va. On Wednesday. To be eligible for the new refinancing program, borrowers must not have missed a mortgage payment for at least six months and have no more than one late payment in the six months prior to that. They also must have a credit score of 580 or better, a threshold that the administration says 9 out of 10 borrowers meet. The borrower's mortgage balance also cannot exceed the loan limits for FHA-insured loans in their communities, which range from $271,050 in low housing cost areas to $729,250 in high-cost ones. They also must own and occupy the home covered by the loan. The administration wants the program to include a provision requiring lenders to take a "haircut" by writing down mortgage balances of deeply underwater loans -- those whose borrowers owe more than 140% of their current home values. By doing so, it would greatly reduce the risk that the borrower will default, the administration said. By refinancing into lower interest rate loans, mortgage borrowers could substantially reduce their monthly payments. Many would go from paying 6% or more to about 4.25%. On a $200,000 balance, that would save about $216 a month on a 30-year mortgage. The program will also offer an option to allow borrowers to refinance into 20-year loans. These will not necessarily reduce monthly payments but will enable borrowers to build home equity more quickly and enable them to finish paying off the loans sooner. The administration wants homeowners to take that option and is proposing that the FHA pay closing costs to encourage them, which would result in an additional average savings of about $3,000. This latest initiative first emerged in last week's State of the Union address, when the president said he would launch a program that could save borrowers thousands of dollars a year by allowing them to refinance into loans at current low interest rates. The president said the plan is an effort to help bolster the housing market, and subsequently the economy. The 3.5 million homeowners the program targets are not in default, the administration said, and the cash freed up could result in more consumer spending. Wants to buy a home to your child? We can help! Please give us a call at (866) 785-3310, and we will answer all your questions professionally. Your goal is our goal. The real estate market took a beating and many people suffered severely but many buyers today still want to have the American Dream and own their own home. The problem is mortgages are hard to get and people are underemployed, but there is a solution that's making housing a family affair. USA Today reported that family mortgages are growing in popularity. The chief executive, Timothy Burke of National Family Mortgage, calls the family mortgage "an opportunity to create a win-win". Burke's company sets up and services intrafamily loans. The idea is that in a time when parents of grown children are looking to earn greater interest on their investment money and simultaneously their grown children are looking to buy a house at a lower interest rate, an intrafamily loan could help both sides. According to USA Today, more than 12 million in loans has been financed to help families through National Family Mortgage. Those intrafamily loans range from an $18,500 down payment to a refinancing for $1.17 million. For many parents the stock market is a big risk. So the opportunity to invest in their child's mortgage is a creative solution for both parent and child. In some cases, loans are so difficult to get that even if buyers have 20% down, they can still be rejected. Additionally, some buyers are losing out to cash buyers. The intrafamily loans are giving some buyers a competitive advantage by allowing them to make an all-cash offer, especially on homes like foreclosures where the market is competitive. According to the National Association of Realtors (NAR), last year, 9% of first-time homebuyers who made a down payment had received a loan from either a friend or relative. Also in 2010, nearly 30%, of those surveyed for NAR's annual Profile of Home Buyers and Sellers, reported that they received a gift from a friend or relative. If you're planning to use the intrafamily mortgage, be sure to meet with experts to help guide you through the process. As more parents help their grown kids get into housing, the American dream stays alive for them. NAR found, in the same study, that without the help, buying a home would be very difficult–nearly 36% of first-time homebuyers needed help with a downpayment. Fueling the interest of parents' involvement in an intrafamily loan are a few powerful factors including: the desire to help family members, the incentive to receive a higher interest return, the increasingly affordable homes, and the concern for their children's economic future. The intrafamily mortgage may be the next best solution to what has not usually been seen in America but is certainly more popular in other cultures, multi-generational housing. However, if families can't combine and live together the intrafamily loan still offers the grown child and the parents an opportunity to help each other in tough economic times. Commercial and multifamily mortgage originations turned sharply upward during the third quarter of 2011, rising 10 percent above levels in the second quarter and nearly doubling originations in the third quarter of 2010. Results of Quarter Three lending was released by The Mortgage Bankers Association (MBA) on Thursday in their Quarterly Survey of Commercial/Multifamily Mortgage Bankers Originations. MBA said that the 98 percent overall annual improvement in commercial/multifamily lending was driven by increases across the board. When compared to the same quarter in 2010, loans for hotel properties increased by 406 percent; retail properties by 164 percent and office properties 103 percent. Loans for multifamily properties were up 39 percent. Offsetting these strong gains were losses of 3 percent and 8 percent for industrial property and health care property loans. Originations increased across all lender types but lending by commercial banks soared, increasing 433 percent over lending one year earlier from an index of 32 to 169. Lending by conduits for commercial mortgage backed securities (CMBS) was up 169 percent (although levels are still low; the index is 42). Life insurance companies increased lending by 61 percent from an index of 176 to 282, and the GSEs Freddie Mac and Fannie Mae increased their lending by 47 percent from 120 to 176. The average loan sizes also increased. For all loans the average was $14.9 million compared to $10.5 million in Quarter 3 of 2010. Loans from conduits averaged $40.5 million, unchanged year-over-year. Commercial bank loans more than doubled in size from $4.9 million to $11.8 million; life insurance companies lent an average of $20.5 compared to $15.5 million and Freddie and Fannies' average loan size rose from $12.6 million to $13.8 million. "Lending on commercial and multifamily properties continues," said Jamie Woodwell, MBA's Vice President of Commercial Real Estate Research. "Mortgage originations by life company portfolios hit another new record in the third quarter, and lending by bank portfolios and Fannie Mae and Freddie Mac also picked-up. Mortgage originations for the CMBS market, which was caught up in the global economic uncertainty of recent months, declined from last quarter, but were higher than last year's Q3 level." Quarterly changes in originations were also impressive; retail property loans increased by 37 percent, office properties 8 percent, hotel properties 4 percent, multi-family properties 2 percent. The remaining two properties types fell in quarterly statistics as well as annual; industrial property originations were down 14 percent and health care properties 30 percent. Among investor types, between the second and third quarters of 2011, loans for commercial bank portfolios saw an increase in loan volume of 55 percent, loans for GSEs 32 percent, and originations for life insurance companies 3 percent. Loans for conduits for CMBS decreased by 48 percent. *The Index has a base of 100 = the average originations per quarter in 2001. Mortgage rates have never been cheaper, with the 30-year rate falling below 4% for the first time in history. The interest rate on a 30-year fixed-rate loan fell to 3.94% this week, the lowest rate since mortgage giant Freddie Mac (FMCC, Fortune 500) began tracking it. Meanwhile, the average for a 15-year fixed-rate mortgage also hit a record, falling to 3.26%. "Average 30-year conventional fixed mortgage rates fell below 4% for the first time in history this week following a sharp drop in 10-year Treasuries early in the week as concerns over a global recession grew," said Freddie's chief economist, Frank Nothaft. Yields on the benchmark 10-year U.S. Treasury bond, which mortgage rates closely track, have been under 2% this week, closing as low as 1.78%.The dirt-cheap mortgage rates can result in considerable savings for homeowners. Compared with just three months ago, when the 30-year was at 4.60%, borrowers today can save about $40 a month per $100,000 borrowed. That comes to a savings of nearly $14,000 for every $100,000 borrowed over the life of the 30-year loan. The low rates have done little to boost home buying, however, according to the Mortgage Bankers Association. Their weekly survey of mortgage applications reported a drop in all loans of more than 4%. Purchase loan applications were almost flat and refinance applications fell more than 5%. "Potential borrowers largely remained on the sidelines, seemingly unimpressed by the lowest (by any measure) mortgage rates since the 1940s," said Mike Fratantoni, MBA's Vice President of Research and Economics. Some industry insiders remain unimpressed by the relentlessly falling cost of mortgage borrowing. "Record low rates, blah, blah, blah: We've already heard this," said Keith Gumbinger of HSH Associates, a mortgage information provider. "Other than the price of money, nothing else has happened." Given the nation's faltering recovery, the turmoil in Europe and the struggling housing market, the downward trend in mortgage rates is natural, according to Gumbinger. "The lowest mortgage rates come at the bleakest periods," he said. season. At least those that are qualified. Mortgage rates are falling, home prices are stagnant, and the nation’s biggest banks have stopped tightening mortgage guidelines for now. Last quarter, for the second straight quarter, just two “big banks” reported a tightening of their respective prime mortgage lending standards. Every other bank either left guidelines unchanged, or loosened them a bit. What does this mean for you? For homebuyers and would-be refinancers, it may lead to simpler and quicker mortgage approvals for the rest of this year, and beyond. Banks need to lend money but they don’t like to lend if they think they are going to lose money. It they are loosening their guidelines they may feel their risks have decreased and are looking to attract more borrowers. It is important that you do not confuse “loosening” lending standards for “easy mortgage money.” Banks are still careful about what they lend and who they lend to. Today’s mortgage approvals carry three basic requirements. Actually these are the same requirement that were in place years ago and referred to as the three “C’s”. There are specific loan programs through the VA and the USDA for which no-equity mortgages (no money down) are still available, but 100% mortgage loans are in the extreme minority these days. Most loans today require some equity or down payment, and the minimum equity standards are higher today than at any time in recent history. Mortgage applicants must now meet strict debt-to-income limits, often set to 45%. This means that your monthly debts–housing costs, bills, etc.–may not exceed 45% of your documented monthly income. Lenders will verify this income via your federal tax returns. Everything must be documented. No more what used to be called “Stated Income” loans where figures were pretty much made up. Mortgages are readily available today with credit scores as low as 600, but the available interest rates are awful as compared to an applicant with credit scores in the low 700s. Banks give the best rates to applicants with credit scores over 740. Want that low advertised rate? Then you better have a supper credit score. Otherwise you will end up being turned down or shocked that your rate isn’t what was advertised. You will not get great mortgage rates simply by putting a lot of money down, or earning more than Warren Buffet. The best mortgage rates are reserved for applicants that show strength across all three categories–not just one. You will need sizable equity, strong income, and high credit scores to be considered a “prime” applicant. This will get you access to a bank’s lowest mortgage rates, and make your underwriting as quick and simple as possible. Mortgage rates are great, homes are affordable, and approvals are getting more plentiful. CURRENT MARKET*: The BestExecution 30-year fixed mortgage rate is still 4.250%. More lenders are however willing to offer 4.00% and 4.125% is approaching BestExecution status. On FHA/VA 30 year fixed BestExecution is 4.00%. Few lenders are willing to quote 3.875% without extra closing costs. 15 year fixed conventional loans are still best priced at 3.75% and we're still seeing aggressive quotes at 3.625%. Five year ARMs are still best priced at 3.25. ARMs and 15 year quotes seem to have bottomed out. It's important that we point out an increased amount of variation in what individual lenders are quoting as their BestExecution rates. This is a factor of price volatility in the secondary mortgage market. Unfortunately when volatility picks up in the secondary mortgage market, the cost of doing business gets more expensive for lenders (hedging costs go up). Those added costs are usually passed down to consumers via extra margin in rate sheets. GUIDANCE: We've realized a good portion of the rates rally we'd been holding out for plus more. But believe it or not, we're still not at "all time highs." There's room for improvement in the primary mortgage market as lenders have no passed along gains to their fullest extent. This is a factor of extra volatility in bond markets. Mortgage rates DO NOT like volatility. Relative to various market levels, rate sheets are conservative yes, but there's no telling when things will get better, and sadly, always a chance that they won't get better at all. Incidentally, we lean toward the possibility of them getting better, but the timing and flexibility required to capitalize on that possibility makes floating a less attractive choice for most scenarios right now, especially when what's on the table is already so much better than everything else 2011 has to offer and fairly darn close to all time low rates. What MUST be considered BEFORE one thinks about capitalizing on a rates rally? 1. WHAT DO YOU NEED? Rates might not rally as much as you want/need. 2. WHEN DO YOU NEED IT BY? Rates might not rally as fast as you want/need. 3. HOW DO YOU HANDLE STRESS? Are you ready to make tough decisions? *BestExecution is the most cost efficient combination of note rate offered and points paid at closing. This note rate is determined based on the time it takes to recover the points you paid at closing (discount) vs. the monthly savings of permanently buying down your mortgage rate by 0.125%. When deciding on whether or not to pay points, the borrower must have an idea of how long they intend to keep their mortgage. For more info, ask you originator to explain the findings of their "breakeven analysis" on your permanent rate buy down costs. *Important Mortgage Rate Disclaimer: The BestExecution loan pricing quotes shared above are generally seen as the more aggressive side of the primary mortgage market. Loan originators will only be able to offer these rates on conforming loan amounts to very well-qualified borrowers who have a middle FICO score over 740 and enough equity in their home to qualify for a refinance or a large enough savings to cover their down payment and closing costs.If the terms of your loan trigger any risk-based loan level pricing adjustments(LLPAs), your rate quote will be higher. If you do not fall into the"perfect borrower" category, make sure you ask your loan originator for an explanation of the characteristics that make your loan more expensive. "No point" loan doesn't mean "no cost" loan. The best 30year fixed conventional/FHA/VA mortgage rates still include closing costs such as: third party fees + title charges + transfer and recording. Don't forget the fiscal frisking that comes along with the underwriting process. To answer any questions or doubts, please contact us. We are here to serve you. In the chart of Consumer Rate Quotes below, if the line is moving up, closing costs are on the rise. If the line is moving down, costs are on the decline. Consumer borrowing costs crept higher last week before plummeting on Friday, then again yesterday, and once again today. Mortgage rates haven't been this low since early November 2010! The size and speed of the mortgage rate rally has been, for a lack of better words, nuts. IMPROVED CURRENT MARKET*: The BestExecution conventional 30-year fixed mortgage rate has improved to 4.375%. Some lenders are even offering 4.25% but that quote carries with it additional closing costs. On FHA/VA 30 year fixed BestExecution is 4.25% with some lenders willing to go as low as 4.00% (includes additional closing costs). 15 year fixed conventional loans are still best priced at 3.75% but we've seen aggressive quotes at 3.625% too. Five year ARMs are still best priced at 3.25%. GUIDANCE: Markets have shifted their attention back to economic fundamentals, which have been supportive of lower mortgage rates lately. And while plenty of indicators do have the potential to improve the overall economic outlook in the days ahead, they're more than likely going to confirm a dour situation and keep a lid on rising mortgage rates. The most influential data-point of the week comes on Friday morning, with the release of the July Employment Situation Report. We'll need this report to confirm the rally we've enjoyed over the past three days. From that perspective, given the size and speed of the recent rally, we may see rates go sideways for a few days and maybe even inch higher. This behavior would not be a sign of shifting sentiment as much as it would illustrate rally exhaustion. Put more simply, no rally lasts forever, especially when a "high-risk event" is just ahead. A path has however been paved for our longer-term mortgage rate outlook to come true. That means we see lower mortgage rates in the not so distant future. Just remember, it may not be a direct path lower, there will be ups and downs along the way. Last week, markets appeared somewhat optimistic with mortgage rates remaining consistently stable despite debit ceiling issues and talks that fell apart prior to the weekend. It seems as though things may change this week as the deadline looms and an agreement has not been reached. Regardless, it is still a good time to lock in mortgage rates that are still at the lowest levels of 2011. Freerateupdate.com's daily survey of wholesale and direct lenders show that conforming 30 year fixed mortgage rates are at 4.250%, 15 year fixed mortgage rates are at 3.375% and 5/1 adjustable mortgage rates are at 2.625%. These low mortgage rates with 0.7 to 1% origination fee are available for borrowers who have maintained good credit and can provide the necessary documentation to receive lender approval. The Mortgage Banker's Association reported the largest increase in refinances for the week ending July 15th which is evidence that borrowers are jumping on this opportunity while it is here. For those with less than perfect credit, low FHA mortgages rates are still very competitive with conforming mortgage rates, either at the same level or slightly higher. FHA 30 year fixed mortgage rates are at 4.250%, FHA 15 year fixed mortgage rates are at 3.750% and FHA 5/1 adjustable mortgage rates are at 3.000%. With a minimum credit score of 580, FHA will accept a down payment as low as 3.5% which can be combined with housing grants and approved gifts. FHA mortgage loans are consumer friendly and continue to be the choice of first time home buyers, even though FHA closing costs (APR) tend to be higher because of the upfront mortgage insurance premium and other FHA fees. Jumbo 30 year fixed mortgage rates moved up and down by .125% and are now at 5.000%. Jumbo 15 year fixed mortgage rates are at 4.500% and jumbo 5/1 adjustable mortgage rates are at 3.625%. These low jumbo mortgage rates are available with 0.7 to 1% origination point to borrowers who have excellent credit. The jumbo mortgage market is not over saturated right now because of the higher conforming loan limit. If that limit decreases on schedule in October, this might change since many properties will again fall into the jumbo mortgage market. There is currently a bill in Congress to further extend the conforming loan limit which, if approved, will help to keep jumbo mortgage rates low. Although investors appeared optimistic last week, MBS prices (mortgage backed securities) fluctuated slightly which had little to no affect on mortgage rates. As MBS prices move, so do mortgage rates move in the opposite direction. Better than expected housing starts for the month of June and a new Greece debt deal led investors to turn to stocks. Markets saw little reaction to the report that weekly jobless claims increased higher than expected. This week can turn out to be completely the opposite as tension sets in over the debt ceiling deadline which is August 2nd. With both parties so far apart on ideas and no sign of an agreement, concern is already influencing markets as MBS prices are starting to drop. Fixed mortgage rates fell this week, and the rate on the 15-year loan dropped to its lowest point of the year. The average rate on the 30-year loan decreased to 4.51 percent from 4.60 percent a week ago, Freddie Mac said Thursday. It reached its yearly low a month ago, at 4.49 percent. The average rate on the 15-year fixed mortgage, popular for refinancing, fell to 3.65 percent from 3.75 percent. Its previous low this year was 3.67 percent, reached three weeks ago. Rates typically track the yield on the 10-year Treasury note. Yields fell sharply last week after dismal jobs data pushed investors into the safety of government bonds. Yields fall as prices rise. Low mortgage rates and depressed home values have done little to revive the struggling housing market. Many people can't take advantage of the low rates because of tighter lending standards and higher downpayment requirements. Lenders are cautious because the weak economy and high unemployment make it more likely that some borrowers will default. Other potential homebuyers are holding off, concerned that housing prices will continue to fall. Few economists expect the housing market to rebound before 2013. The average rate on a five-year adjustable-rate mortgage edged down to 3.29 percent from 3.30 percent last week. Two weeks ago, it hit 3.25 percent, its lowest level on records dating back to 2005. The average rate on the one-year adjustable loan fell to 2.95 percent, a record low, from 3.01 percent. The average fees for the 30-year loans were unchanged at 0.7, according to Freddie Mac's survey. Average fees for the 15-year fixed loan and the five-year ARM were 0.6. The average fees for the one-year ARM fell to 0.5. It’s 2011 and you are thinking of buying a new residence but property news says there have been transformations in the Mortgage curiosity rates and that has made you a little reluctant to proceed with the buying process. 1. Credit score Needs – The minimal credit score that most creditors are heading to call for in purchase for a house buyer to get a home loan loans is 640. If there are financial institutions that possess reduce credit score rating requirement, expect significantly stricter guidelines enjoy a required straight down fee and 3 to 4 months mortgage fee in the bank soon after you close. 2. FHA Loans – FHA is a the us government company that insures loans furnished by FHA accepted creditors. FHA will insure loans straight down to a 540 credit score rating with 20% straight down. However, a bank has their own set of guidelines the place in a lot instances is only ready to financial FHA loans straight down to a 640 credit rating. It can be confusing but the safest way for a residence loans to be accepted is by way of having a credit score rating of 640 and above. 3. Conventional Loans – Most lenders require a 660 credit score to get a conventional loan, a type of loan for borrowers with good credit scores and money to put down, financed and a minimum of 5% down of the sales prices. In this case, the higher your credit scores are the better terms you will get. 4. VA Loans – That kind of loans is for veterans the place a lot lenders demand a 620 credit score rating also however it is 100% financing. To be qualified for it type of loans, a DD-214 is required to display to if the consumer was honorably discharged. 5. USDA – It loan is also 100% financing but that loan is intended for homes in the non-urban areas. Presently, most creditors could go lower to a 620 credit rating, which’s why it is attractive to moderate income families. 3. Conventional Loans – Most creditors call for a 660 credit score score to get a conventional loans, a form of loans for debtors with excellent credit scores and income to put down, financed and a minimum of 5% straight down of the gross sales prices. In it case, the higher your credit scores are the better conditions you will get. Want to buy a home? Speak directly with us to determine the best options We are here to help you clarify matters on loan amounts, mortgage qualification, and affordability. The low initial cost of adjustable-rate mortgages, or ARMs, can be very tempting to home buyers, yet they carry a degree of uncertainty. Fixed-rate mortgages offer rate and payment security, but they can be more expensive. Here are some pros and cons of ARMs and their fixed-rate brethren. Feature lower rates and payments early on in the loan term. Allow borrowers to take advantage of falling rates without refinancing. Help borrowers save and invest more money. Offer a cheap way for borrowers who don't plan on living in one place for very long to buy a house. Because lenders can use the lower payment when qualifying borrowers, people can buy larger homes than they otherwise could buy. Instead of having to pay a whole new set of closing costs and fees, ARM borrowers just sit back and watch the rates -- and their monthly payments -- fall. Someone who has a payment that's $100 less with an ARM can save that money and earn more off it in a higher-yielding investment. Rates and payments can rise significantly over the life of the loan. A 6 percent ARM can end up at 11 percent in just three years if rates rise sharply. The first adjustment can be a doozy because some annual caps don't apply to the initial change. Someone with an annual cap of 2 percent and a lifetime cap of 6 percent could theoretically see the rate shoot from 6 percent to 12 percent 12 months after closing if rates in the overall economy skyrocket. On certain ARMs, called negative amortization loans, borrowers can end up owing more money than they did at closing. That's because the payments on these loans are set so low (to make the loans even more affordable) they only cover part of the interest due. Any additional amount due gets rolled into the principal balance. Rates and payments remain constant. There won't be any surprises even if inflation surges out of control and mortgage rates head to 20 percent. Stability makes budgeting easier. People can manage their money with more certainty because their housing outlays don't change. Simple to understand, so they're good for first-time buyers who wouldn't know a 7/1 ARM with 2/6 caps if it hit them over the head. To take advantage of falling rates, fixed-rate mortgage holders have to refinance. That means a few thousand dollars in closing costs, another trip to the title company's office and several hours spent digging up tax forms, bank statements, etc. Can be too expensive for some borrowers, especially in high-rate environments, because there is no early-on payment and rate break. Are virtually identical from lender to lender. While lenders keep many ARMs on their books, most financial institutions sell their fixed-rate mortgages into the secondary market. As a result, ARMs can be customized for individual borrowers, while most fixed-rate mortgages can't. 1. How long do you plan on staying in the home? If you're only going to be living in the house a few years, it would make sense to take the lower-rate ARM, especially if you can get a reasonably priced 3/1 or 5/1. Your payment and rate will be low and you can build up more savings for a bigger home down the road. Plus, you'll never be exposed to huge rate adjustments because you'll be moving before the adjustable rate period begins. 2. How frequently does the ARM adjust, and when is the adjustment made? After the initial fixed period, most ARMs adjust every year on the anniversary of the mortgage. The new rate is actually set about 45 days before the anniversary, based on the specified index. But some adjust as frequently as every month. If that's too much volatility for you, go with a fixed-rate mortgage. 3. What's the interest rate environment like? When rates are relatively high, ARMs make sense because their lower initial rates allow borrowers to still reap the benefits of homeownership. Rates could fall even further, meaning borrowers will have a decent chance of getting lower payments even if they don't refinance. When rates are relatively low, however, fixed-rate mortgages make more sense. After all, 7 percent is a great rate to borrow money at for 30 years. 4. Could you still afford your monthly payment if interest rates rise significantly? On a $150,000, one-year adjustable-rate mortgage with 2/6 caps, your 5.75 percent ARM could end up at 11.75 percent, with the monthly payment shooting up as well. Savings with fixed-rate mortgage over 4 years: $5,436. In the above case, the fixed-rate mortgage costs less than the worst-case ARM scenario. Experts say when fixed mortgage rates are low, they tend to be a better deal than an ARM, even if you only plan to stay in the house for a few years. For the first time in years, buying a home may beat renting. The net result is that home price gains would need to average only 3.25% annually to beat renting, according to Beracha and Johnson. To make the math work, you have to stay in the home for at least eight years. Beracha and Johnson compared the cost of owning with the cost of renting. Renting has usually come out ahead, they say. Buying typically leads to higher monthly and annual bills once all costs are factored in -- mortgage payments, property taxes, maintenance and transactional costs. Those higher costs can be offset if the home gains in value. But renters -- the researchers assume -- can invest the savings. And that is a big part of why the professors say renting has typically been the better deal. "I was shocked at how often renters won," said Johnson. Another reason had been the push to homeownership, which resulted in a premium on home values. "My dad always told me not to 'throw my money away on rent,'" said Johnson. "This mania toward homeownership tends to drive prices up." But that's changing: Homeownership has dropped to 66.4% from a peak of 69.1% in 2005, according to the Census Bureau. For several cities, including New York, Boston and Dallas, renting is still preferable. In New York, for example, homeowners would need a 7% annual rise in home values to beat renters. Renters, meanwhile, are just as likely to spend their savings. They'll wind up with less money than homeowners, which is kind of what your dad was saying all along. Rising gas prices have spurred homebuyers to look for homes that offer shorter commute times to work, according to a survey of Coldwell Banker Real Estate professionals. The company conducted the survey online between April 28 and May 3, 2011, and garnered responses from 1,188 Coldwell Banker real estate professionals. Three-quarters of respondents said the recent jump in gas prices had influenced where their clients chose to live. The main client concern was commute time to work: 89 percent of respondents said buyers look for homes closer to work and 93 percent said a continued rise in gas prices would prompt more homebuyers to choose to live where commute times are shorter. Almost half (45 percent) of respondents said buyers are choosing homes closer to shops and services as a result of higher gas prices. According to 77 percent of respondents, more buyers are interested in having a home office compared to five years ago. Of those respondents, 68 percent said the high cost of gas is one reason behind the trend. "The decision to buy a home has always been tailored around the personal, multifaceted lifestyle needs of each buyer," said Jim Gillespie, Coldwell Banker Real Estate's CEO, in a statement. "Today, rising fuel costs and a person's decision to commute or perhaps work remotely are additional factors of the decision homebuyers must consider." Respondents also attributed a rise in interest in urban living at least partially to increasing gas prices. Some 56 percent of respondents said they had noticed more homebuyers interested in living in cities compared to five years ago. Of those respondents, 81 percent said a desire to reduce gas spending was a factor, and 93 percent agreed or strongly agreed that the desire for shorter commutes was a factor. Other reasons noted for the increased enthusiasm for city living were "having everything at your fingertips" (91 percent strongly agreed or disagreed), "being able to walk to places" (76 percent), and "being near public transportation" (52 percent). Regardless to the factors, we can help you choose the best and assist you through the process.